A photo of a female customer at the Natural Kuumba Hair Salon. 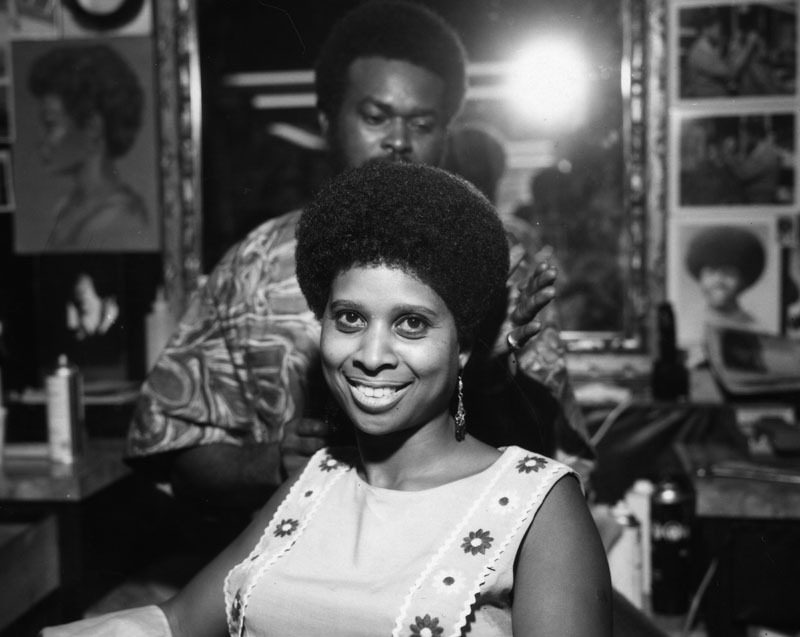 Curtis, Rolland J., “Natural Kuumba Hair Salon,” Digital Public Library of America, http://dp.la/item/ed7adc7df523e3586450e68128c93dec. A photograph of the back steps of apartments on Chicago’s South Side, 1941. An excerpt from a Chicago commission report on building new neighborhoods, 1943. A photo of an African American woman working as a domestic, 1939. A photo of an African American chauffeur, 1939. A photo of African American women in 1950s attire. A photo of a bride and groom in traditional Nigerian dress. A photo of crowd gathered after a white supremacist protest of the arrival of the first black family to an Atlanta neighborhood, 1946. A television news clip about integration challenges in a Fort Worth, Texas, neighborhood, 1956. A 1967 political cartoon about war and residential integration. A photo of Lorraine Hansberry at the time A Raisin in the Sun opened in New Haven, Connecticut, prior to its run on Broadway, 1959. A photo of actors playing Walter Younger, Ruth Younger, Beneatha Younger, and Karl Lindner in the first stage production of the play, 1959. A photo of actors playing Walter Younger, Ruth Younger, and George Murchison in the first stage production of the play, 1959. A photo of actors playing Walter, Ruth, and Beneatha Younger in the first stage production of the play, 1959.